Except for dinnerware pieces Frankoma did no new shaker design work from about 1942 until about 1950. Those were the war and early post-war years. The early goal of John Frank to bring inexpensive art pottery to the masses was now being pressured by economic reality. The great out-flowing of design and production associated with the post-fire period was Frankoma’s answer to the freezing of imports associated with WWII. By 1950 the war was over and post-war adjustments were taking place. The flow of foreign ceramic miniatures had resumed. Frankoma needed an answer. The result, among other efforts, was this group of mid-century shakers, and a number of advertising and commemorative issues. Many of these seem more practical or market oriented and less artistic than earlier issues. Frankoma's success with colored dinnerware had by the late 1940's lifted the company to new heights. In 1948, with new financing now available, John Frank expanded the factory. Frankoma had produced the wagonwheels and Mayan-Aztec lines since 1942. Now it was poised to introduce the Oklahoma plainsman dinnerware set and other new items. This outpouring of new items included the first of the mid-century shakers, the barrels in 1950 and the wheat shocks in 1951. The expansion also demanded new catalogs. Starting in 1948 Frankoma issued a new catalog almost every year. 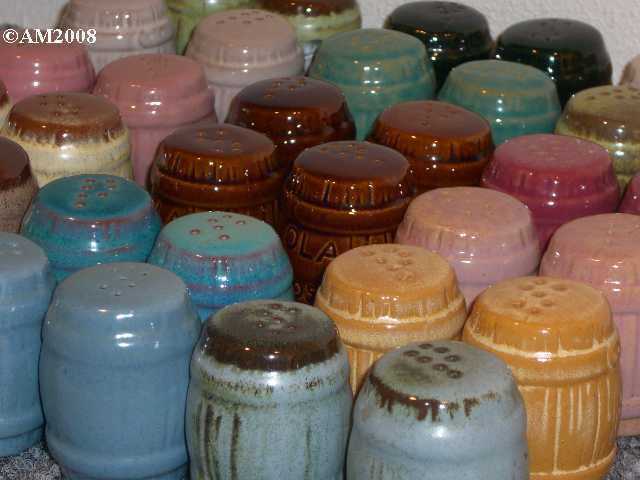 The production of mid-century shakers is thus better documented than most earlier issues.